Just wanted to let you guys know we will only have a LIMITED amount of live shrimp and dead shrimp. We are sorry to ALL customers that this will affect. It will be first come, first served. Please pick some up on you way down, if you can! Thanks again & sorry. ATTENTION: WANT A CHANCE TO WIN A FREE CHARTER WITH CAPTAIN JACK + A ONE NIGHT STAY @ SWEETWATER??? & A CHANCE TO WIN $1000? All money collected will be going to Saint Bernard Catholic Church! Captain Jacks & Sierraâs daughter, Gracie, will be selling tickets for the boat blessing to be queen, if anyone would like to buy tickets..we will be selling them @ Sweetwater Marina. The chance to win $1000 is through Saint Bernard Catholic Church..with ALL money going to them...we will also be putting anyone who supports Gracie and buys tickets in our own personal raffle for a charter (all inclusive) & one night stay @ Sweetwater Marina. Its buy 5 tickets ($1 each), get 6 chances to win $1000 and 1 chance to win a free charter trip with Captain Jack & a free night stay @ Sweetwater Marina!! So $5 dollars, 6 tickets for the $1000 dollar raffle and 1 ticket in our personal raffle of the free charter & 1 night stay @ Sweetwater! Both drawings will be Held July 27th, 2019! Please message Sweetwater or Sierra Alfonso with questions. Thanks to all who support Gracie! Hey..Its Captain Jack! Just want to give you a quick Sweetwater report. It was extremely busy today. All kinds of different reports came in. Most of our regulars had beautiful, beautiful, beautiful speckled trout & lots of them. We had reports from good to bad. Even when the trout are biting, the weather is beautiful, perfect conditions, some people just donât catch. Overall, it was a successful day. There wasnât a lot of tide range. Tomorrow is going to have a small range in the tide, but as long as you have some wind moving the water..thats like having a tide. Today we made it through the rush with bait, but good news is..we should have plenty bait for tomorrow. If you get an opportunity and youâre itching, it is DEFINITELY worth coming. The water has been clearing up with the Easterly winds, so tomorrow should be clearer than today. Hope to see you all here at Sweetwater. It's going to be hard to fish a place to tick in out of the wind this Saturday, maybe a few little spots directly across from the marina where you might be able to get out of the wind. And we should have live shrimp. It was this morning. We have a picture of her on our FB page. We are very sorry you didn't enjoy your experience staying with us at Sweetater Marina. We value all of our customers and welcome their feedback. To that end Capt. Jack spent some time today going through the towels and checking the lights in the rooms to see if they need to be changed or could have higher watt bulbs in them and just generally checking all the rooms. We will also be making sure all rooms have an extra set of sheets, a blanket and a pillow in the drawers under the bunk beds. As for being pricey, we feel that our prices on shrimp and gas are competitive with other Marina's in the area and are more than fair. And we know it's a hike up the stairs, but since we were built after Katrina we had no choice. However, we do take issue with your claim that there was no sofa sleeper in your room. Rooms 2-5, we believe you were in room 5, absolutely all have a full size sofa sleeper (although Capt. Jack recommends just sleeping on ythe sofa though because the sofa bed is not very comfortable). Again, we appreciate your business and the feedback and are changing some things because of it and hope you will give us another try next time you are in Delacroix. We have been hearing of a few caught here and there, but Capt. Jack hasn't caught any himself. we would love to see you tomorrow morning at Sweetwater Marina. Capt. Jack will not be there until a little later tomorrow, but just ask for Mr. Ronnie. He will be able to point you in the right direction and put you on the fish. Hopefully Capt. Jack will be there when you get back. You picked a good time for your 1st Delacroix fishing trip. The fishing has been great this year. Good luck. We are very sorry about your experience. Having all been in similar situations we would hope that rules would be bent and common sense employed. We also know our young staff understands how important customer service is to us at Sweetwater and we see them go above and beyond on a daily basis to make sure anyone launching at Sweetwater has a great experience. Capt. Jack has already made some phone calls and dscussed how to better handle this type of situattion in the future. As always, we appreciate any input from our customers, good and bad. Capt.Jack just read this post and is very sorry that you got stuck and we were unable to help, but to be fair, Capt. Jack always goes the extra mile not only for his customers, but anyone who needs help. Just a couple of weeks ago he purchased bamboo, then in addition to the $ spent on the bamboo, spent an entire day with one of his employees to mark the channel to help keep folks from getting stuck. On one Saturday last month we had 5 people call who were stuck and wanted to get towed in. In almost all cases an airboat was needed, Jack couldn't get to them even if he had been here. That day and on many other days we spend countless time on the phone with the St. Bernard Sheriff, Coast Guard and Sea Tow. We made sure everyone made it in even though Jack couldn't help them himself. And please keep in mind that Capt. Jack is not always here. Running a Marina entails much more than sitting in the bait shop helping launch boats. 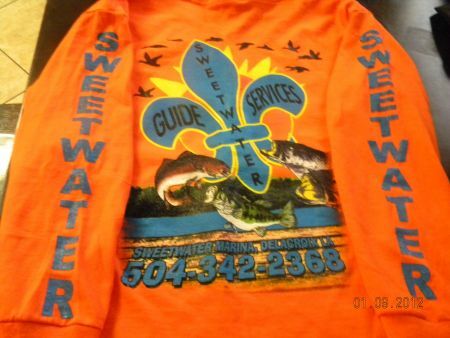 We appreciate everyone who defended Sweetwater And Capt. Jack. We love our customers, ya'll are great. We are also in full agreement about Sea Tow. BECOME A MEMBER. We are also truly sorry for this anglers experience, while we try to make everyone's experience down here in Delacroix a good one (even if you don't launch here), unfortunately you can't please everyone. That goes for any business and life in general. A comment titled: Captain Jack - Sweetwater Marina in response to a report titled: !!! !BEWARE OF SERINGE'S LAUNCH!!!!! Capt. Jack doesn't have a feud with anyone and has always been willing to work with and be helpful to anyone and everyone he meets. Those of you who are regulars at Sweetwater and have met Jack know this already. He is working very hard to get his shrimp boat up and running and to get fuel put in to make his business better, not to put anyone out of business. Once he has live bait and fuel on a regular basis it will be available to anyone, no matter where they launch. His goal is not and has never been to put anyone out of business. Anyone who fishes Delacroix regularly knows there is plenty of business to go around. Thanks Spec hound. Captain Jack couldn't get them today though. He went out with Captain C.T. for a fish and game report. They tried for trout, on top and bottom, they did not bite today. He said they caught a few here and there. They limited out on Reds in Oak River. Reds arejust as good as tey have been. Thanks for all the kind words. Happy customers is our number one priority here at Sweewater. It's nice to hear that we are accomplishing our goal. We couldn't do it with out all of our great, loyal customer's. Unfortunately we will be out of live shrimp this weekend. Captain Jack suggests getting your shrimp at Gulf Outlet Marina or Bait Inc. before you head out here to Delacroix. We will be happy to get you pointed in the right direction when you come down here to Sweetwater. Just ask around and the advise will start to flow. See ya soon! We certainly have live shrimp here at Sweetwater for your needs. Come on down. We look forward to seeing you! actually thats capt jack's girlfriend guys.